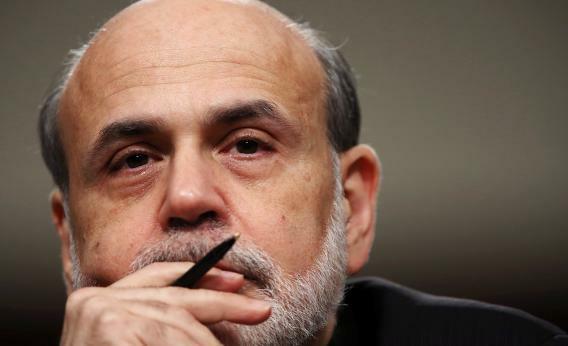 Federal Reserve Board Chairman Ben Bernanke testifies before the Joint Economic Committee on Capitol Hill June 7, 2012, in Washington, D.C. Photograph by Win McNamee/Getty Images. My former boss Michael Tomasky has a column up arguing that Obama should offer a one-year extension of the Bush tax cuts in exchange for Republicans agreeing to spending-side stimulus. His logic, I think, is fairly impeccable. Republicans will probably turn this down, which would be advantageous to the White House in the politics of taxation. And if they say yes, it’s a win for the White House because both sides of the deal will pack some short-term job creation punch. In translating their ideas to the activist audience at Netroots, Krugman and others tend to skip over the fact that monetary stimulus from the Fed is pretty clearly necessary. Just ask yourself what the world would look like if some optimal fiscal policy were enacted and growth accelerated to the point at which we were adding 300,000-400,000 jobs a month instead of 100,000-200,000 jobs. Well, millions of new workers would start burning gasoline and commuting to their new jobs. Millions of Americans would start moving out of their mom’s basement or their sister’s spare room to rent their own place. They’ll be running their own heaters and air conditioners. They might eat out a bit more often, and cook a bit less rice and beans and a bit more meat. That means higher prices. Some of the discussion of these issues seems stuck in the winter of 2008-2009 when the economy was in free-fall and the price level was actually falling, and it could be argued that fiscal measures were giving the Fed a helping hand in offering a nominal boost to the economy. But even though the labor market continues to be weak and real output continues to be well below potential, that’s not the situation we’re in anymore. It’s not at all clear that you can have rapid convergence to full employment without prices at least temporarily increasing at above a 2 percent rate, so a central bank determined to prevent price increases is going to kill any kind of recovery your fiscal policy might produce. Which is all just to say that a clever political gambit around fiscal policy is a poor substitute for monetary action that can produce millions of jobs in a short span of time. But the only way for this to happen is for people to get jazzed up about it. Instead liberals seem very eager to lambaste the Fed for its role as a bank supervisor while letting it off the hook for crucifying mankind upon a cross of 2 percent inflation targeting.